While researching George Reeves's life and that of his family in 2007 for The Adventures Continue, I had used city directories to establish residences and employment statuses of Reeves and various relatives. The 1937 Pasadena directory listed George L. Bessolo as a secretary for H.M. Overgaard. The city directories never listed him as an actor at the Pasadena Playhouse, but rather as a salesman through the 1930s and, in this one case, as a secretary. Only able to find a few unsettling items about Overgaard initially, I returned to him about ten months later, when in early 2008, the Ancestry.com database made available Los Angeles County voter registration records from the 1930s through the 1950s. Comparing the voter registration records, which can be more reliable than city directories for address verification, I noticed several remarkable items. Harvey M. Overgaard was residing with Helen and George Bessolo from 1934 through at least 1938 or 1939 at the 1447 North Michigan Avenue, Pasadena address, where the Bessolos along with Frank Bessolo, up until the divorce in 1932, had lived since 1919. Overgaard was listed as a broker in the Pasadena City Directory as well as in the Pasadena City Precinct No. 145 Register of Voters. He was a registered Democrat. Previously, in 1932, Overgaard is listed in the Los Angeles City Precinct, No. 744 Register of Voters as living at 1023 West Sixth Street in Los Angeles. Although he had been married to a Helen Overgaard and had a daughter, H. Elaine Overgaard, no wife is listed. By 1934, he is living with the Bessolos. Only Helen L. Bessolo, a registered Republican, and Overgaard are listed for the Pasadena Register under the North Michigan Avenue address. By 1936, the Pasadena City Precinct, No. 100, lists Helen, now a registered Democrat, with George L. Bessolo, a salesman and Democrat, living with Overgaard. In 1938, the same precinct only lists one Bessolo, George L., a salesman and Democrat at the North Michigan Avenue address. However, Harvey M. Overgaard (broker and Democrat) and Mrs. Helen L. Overgaard (housewife and Republican) are listed at the 1447 North Michigan Avenue address. At first, I wondered whether Overgaard's wife, another Helen, born in Sioux City, Iowa, according to 1920 Census records, might actually share Helen Bessolo's initials. It seemed odd that Helen Bessolo should rent part of her house, given her inherited family income, in addition to the substantial $87,500 won from a divorce lawsuit in 1935, as well as a home valued at $18,000 in 1930 in her 1932 divorce settlement. Mrs. Bessolo had also been a registered Republican for most of her adult life, with the exception of being registered Democrat in 1936. She and Frank Bessolo in 1926 were both registered Republicans. Interestingly, Frank is listed as a broker. No Helen Overgaard is listed in Pasadena in city directories or voter registers in the 1930s. By 1940, apparently, living alone, Harvey Overgaard had moved back to Los Angeles. In fact, Helen Bessolo is listed as a widow in the Pasadena City Directories in 1936 and 1938, either by her own admission or by the confusion or typographical mistake of the transcriber. We know that she and Frank Bessolo had divorced in 1932, and that he lived in various Manhattan Beach addresses up until his death in 1944. Since writing my initial article in June, 2007 on Frank Bessolo, I have also discovered that Bessolo had married Alice Aletha Bessolo by 1936. They are registered Democrats living at 3009 Vista Drive in Manhattan Beach. Frank is listed as a salesman, and Alice as a housewife. In 1938, Bessolo and his wife return to being Republicans and are now living at 421 Marine Avenue. In 1942, only Frank is listed as a merchant living as 473 34th Street. His wife apparently failed to register to vote that year. This reflects previous public records and information from several sources that Bessolo worked as a retail liquor salesman during the 1930s and eventually owned a liquor store in Manhattan Beach. Recently, I also gained access to over five articles from the Los Angeles Times about Harvey Overgaard and a tell-tale public record that led to more questions than answers about Helen Lescher Bessolo. The 1920 Sioux City, Iowa Census, dated January 19, lists the Overgaards as Harvey M., born in South Dakota, age 29, stock broker, in the industry of oil, with a wife, Helen, born in Iowa, age 25, and Elaine, born in Iowa, age 2½. Overgaard's World War I Draft Registration Card lists him as having been born on March 19, 1889 in South Dakota and currently living in Sioux City, Iowa. The next mention of Overgaard in the public record is a sensational one; and indeed, he lead a dramatic life from the 1920s through the 1930s, until the trail disappears in 1940 as a professional swindler. I have not been able to find a Social Security Death Index record or any documentation about him after the 1940 Los Angeles voter registration roll. The Monday morning edition of the December 12, 1921 Los Angeles Times, announces, "Hold Broker as Fugitive. H.M. Overgaard, Hunted for Months, Jailed Here. Iowan Indicted Year Ago is Surprised by Arrest." Overgaard was arrested at the family dinner table at 1405 North Hobart Boulevard in Los Angeles. His daughter is listed as six-years-old and his wife as "prominent in Sioux City society." He was "charged with two bench warrants" for "conspiracy and misrepresenting the earning power of corporate securities" in Denison, Iowa, Crawford County in November of 1920. He and his family had moved to Los Angeles three months prior to the article. He was booked as a fugitive from justice. There is one conflicting element: the 1921 article lists his daughter as six while the 1920 census lists her as 2½. Overgaard set his sights higher by joining forces with five stock brokers who were involved in a "gigantic swindle of citizens of San Bernardino county." In a Los Angeles Times article, "Directors to Reopen Chino Bank," dated July 4, 1923, the Farmers' and Merchants' State Bank of Chino reopened after being closed due to being swindled of the needed amount required by law to remain open. Five brokers were under indictment, and one arrested for allegedly taking close to one million from local citizens. C.J. Little and Charles F. Wood were indicted. "Complaints have been issued against Charles F. Caverre, H.N. (sic) Overgaard, C.J. Little, Charles F. Wood and P.P. Hooper, charging them with conspiracy to obtain $200,000 by false representations and promises." providing the complaints are withdrawn." The State Corporation Department wanted to book him for forty counts, including grand larceny. He sold false stock in the Bon Air Coal and Iron Company of Tennessee. However, friends were attempting to offer the victims money if the case were dropped. A month later, according to the Los Angeles Times article, dated July 16, 1925, Overgaard, "asserted leader of a group of swindlers operating in California during the last several years, was found guilty" by the jury. The case was reported as "the most stubbornly contested criminal action ever recorded here." Overgaard next appears on the City of Los Angeles Voter Registrar of 1932. It appears he is living in an apartment building, rather than a single-family residence. No wife is listed. Residents of 1023 West Sixth Street include Mrs. Gertrude Hopkins, Samuel Poorman, Jr. and Harvey M. Overgaard. By 1934, he is living in Pasadena with the Bessolos. The 1930 Sioux City, Iowa Census indicates that Helen and H. Elaine Overgaard have returned alone to their hometown. Mrs. Overgaard is reported as age 36 and married and her daughter, 13, giving her an approximate 1917 birth date. However, in The Los Angeles Times article dated January 6, 1935, "Homes Forsaken by Hundreds," which reports on society parties during New Year's Week, "Messrs. and Mmes." are listed as entertaining at the Del Mar Club in Santa Monica. H. M. Overgaard is listed. It is possible he and others could have been without wives and only grouped under the heading. Or, Overgaard may have been accompanied by Helen Bessolo, who was assumed to be his wife by the reporter or those present at the party. In 1936, according to a marriage license available in the Ancestry.com database, Overgaard's daughter married a Nebraskan. She is listed as being from Sioux City, Iowa, which indicates that she and her mother did return and remain in Iowa during the 1930s. The recalcitrant broker had yet another deal to pull. On May 25, 1935, Overgaard was arrested at 1447 North Michigan Avenue, Pasadena, and charged with eight counts of violating the Corporate Securities Act. The Los Angeles Times article, "Broker Arrested on Accusation of Unlicensed Sale," (May 26, 1935), states that Overgaard "filed a false application for a broker's license and on seven occasions sold securities for clients for profit without having a license." It is likely he was stripped of his broker's license in 1925 and had to operate illegally as a broker for his livelihood. He was released on a $10,000 bond. The question is did Helen Lescher Bessolo know she housed a former felon and, most likely, a divorced man? She was a woman who put much care in the appearance of propriety, by claiming in the 1920 Pasadena Census that her husband was the biological father of her son and her first husband. In 1932 or 1933, after returning from a trip to New Orleans, she had gone as far as allegedly telling her distraught, suicidal son that his beloved stepfather had killed himself after the 1932 divorce (as reported by Jim Beaver in interviews with Reeves's relatives). In fact, Frank Bessolo was alive and suing her for claiming his stock worth $87,500 in the Italian Vineyard Company, in which his brother was the Secretary, as her own property. She lists herself as a widow in several cases in the annual Pasadena City Directories of the 1930s. In the 1938 Pasadena City Directory, she lists herself as the widow of Frank: "Bessolo, Helen L (wid F J (sic))." George is listed as "Bessolo Geo L sec H M Overgaard." As mentioned earlier, the Pasadena Register of Voters reports Overgaard as living at the Bessolo home. While Reeves was regularly working as an actor and personal secretary to Pasadena Playhouse Director, Gilmor Brown, as well as probably doing odd jobs to make money, he listed himself as secretary to a formerly convicted felon. However, we do not know whether the Bessolos knew Overgaard was a felon when he entered their household in 1934. He may have appeared to be a dashing, well-bred, financially well-off man to a recently divorced woman of some means. She twice married a broker, and while only conjecture, may have met Overgaard socially through Frank Bessolo's brokerage or banking network or, after the divorce in order to manage her finances. And, yes, reader, she married him. Mrs. Bessolo knowingly married a man arrested for operating without a broker's license in her own home and a man formerly convicted of financial improprieties. Without proof of the actual lawsuit and the lack of additional reporting from the Los Angeles Times and other local papers, I cannot say whether Overgaard's attorneys overturned the 1925 court decision. At this time, I cannot prove what the legal outcome was for the 1935 arrest. Florida marriage records prove that "Helen Bessolo" married "H.M. Overgaarde" (sic) on June 16, 1938 in Bay County, in Panama City (Editors note: see below). Their 1938 marriage index number is 10974 (Ancestry.com. 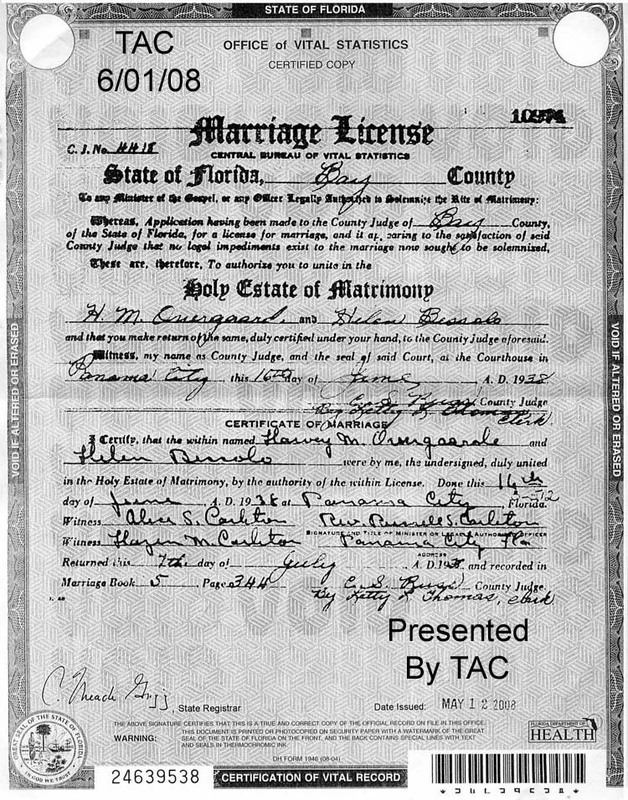 Florida Marriage Collection, 1822-1875 and 1927-2001, Florida Department of Health). The minister and his wife served as witnesses. Overgaard was approximately 49 with Helen about age 45. I would suspect that she kept the marriage a quiet event and divorced him by 1941. She always gave her name as Bessolo in city directories and voter registration records since her marriage to Frank Bessolo in 1919 until her death in 1964. Further research will tell the full story. During the summer of 1938, George Bessolo likely stayed home in Pasadena rehearsing for two of his most significant performances and well-suited roles at the Pasadena Playhouse as the leads in two of George Bernard Shaw's plays. On June 27 he played Sergius in Arms and the Man, along side Frank Ferguson. On July 11 he appeared as Hector Hushabye in Heartbreak House. During August and September, he made his second trip to Europe as Gilmor Brown's secretary where Brown scouted for new theatrical properties. He would soon launch his film career. Serena, Thank you for this most interesting and informative article.